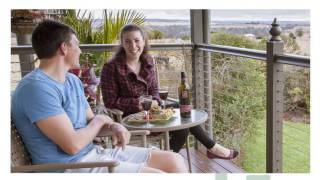 Award winning Mulanah Gardens Bed and Breakfast Cottages is set in idyllic and well-sculpted gardens within 200 acres of picturesque rural land 18 kilometres outside of Kingaroy, in the heart of South Burnett. The owners and hosts, Lindsay and Rhonda Kath, have created a beautifully landscaped garden, which is the setting for two luxury, well-appointed cottages, where you will be encouraged to relax and pamper yourself. While staying, you can take advantage of the billiard room, outdoor chess or luxury packages, which include Swedish massage, local produce hampers, or a Honeymoon Indulgence package. Your hosts will even order and collect meals from one of the finest local hotels, so you don't have to leave your cottage. They are able to put a perfect package together for your needs. Just ask! After an experience - you can also explore the South Burnett, home to natures own Bunya Mountains and two of Queensland's biggest inland waterways, not to mention some of the most scenic agricultural countryside in Queensland. Self-contained kitchen and living area. Separate bathroom with spa, as well as a bedroom with queen size bed and sofa bed. Other facilities include wood fire, air-conditioner, television, DVD player, stereo and gas barbecue on the veranda. Very private and luxury at its best! Self-contained kitchen and living area. Romantic bedroom setting with wood fire, air-conditioner, television, DVD player and stereo. Queen size bed and spa overlooking panoramic views. You can enjoy these surroundings with the complimentary port, or with an outdoor barbecue in a peaceful setting. Private and luxury at its best!